3 or more injections with rapid-acting insulin and 1 to 2 injections with long-acting insulin per day. Insulin pump therapy replaces the need for frequent injections by delivering rapid-acting insulin 24 hours a day. A programmed insulin rate mimics the basal (background) insulin production by the pancreas and can be better adjusted to the body's needs. Rapid-acting insulin acts very quickly to help minimise variations in blood glucose levels in response to carbohydrate intake or, if needed, to lower high blood glucose values. 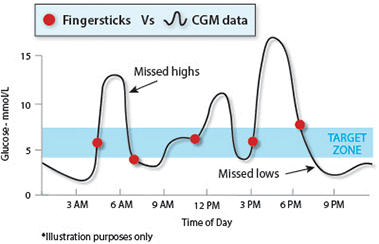 When you monitor your blood glucose with a fingerstick test, you measure it at the moment you perform the test. To get an even better picture of how well you're managing your diabetes, it is important to look at your average blood glucose levels over a few months. The test used to work this out is the haemoglobin A1c (HbA1c) test. HbA1c is a kind of chemical 'footprint' that shows how much glucose has been in your bloodstream over the past 60 to 90 days (the average lifespan of a red blood cell). Research shows that, for people living with diabetes, an HbA1c level of ≤ 7 greatly reduces the risk of long-term complications1,2. Whether you use an insulin pump or injections, it's important to have your HbA1c levels tested at least every three months by your doctor, endocrinologist or diabetes educator. That way you can get a clearer picture of how well you're doing and make the necessary treatment and lifestyle adjustments to do even better. When you take BG tests to look at your glucose values you will likely be asked to take 5-10 readings per day. This provides several snapshots as to what your glucose values are at that time, but it does not give information as to whether your glucose levels are going up or down. Continuous Glucose Monitoring consists of a small device which contains a small electrode that sits under the skin and will take a glucose reading up to every five minutes (288 per day) and send those individual readings as well as a graph of our previous readings to your pump or phone. This allows you to see not only your current glucose reading but also what it looked like earlier in the day and will also let you know if your glucose values are currently going up or down. It is important to establish a routine for when your blood glucose is low. Have something available to treat a low and you are less likely to over treat and raise your glucose levels too much. 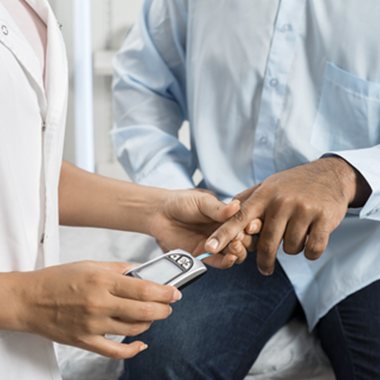 The goal of treating hyperglycaemia is to prevent Diabetic Ketoacidosis (DKA) and delay or prevent diabetes complications due to high blood glucose over an extended period of time. Medications (sugar-free) for cough, congestion, nausea or vomiting, and fever. If you are using an insulin pump, it is important to be proactive about keeping your infusion set healthy and your insulin, reservoir, and infusion set fresh. With a little care, you can take full advantage of the benefits of insulin pump therapy and avoid serious problems. See how you can better control your hypos. See how you can safeguard your future and avoid long term complications. The Diabetes Control and Complications Trial (DCCT) Research Group. The effect of intensive treatment of diabetes on the development and progression of long-term complications in insulin-dependent diabetes mellitus. NEJM. 1993;329(14):977-986. The Diabetes Control and Complications Trial/Epidemiology of Diabetes Interventions and Complications (DCCT/EDIC) Study Research Group. Intensive diabetes treatment and cardiovascular disease in patients with Insulin Dependant Diabetes. NEJM.2005;353(25):2643-2653.3.Diabetes Australia. (2016).Managing sick days for Type 1 diabetes.Available at: https://static.diabetesaustralia.com.au/s/fileassets/diabetes-australia/89f49125-e2e9-4233-868e-c8fe46d99b4e.pdf.